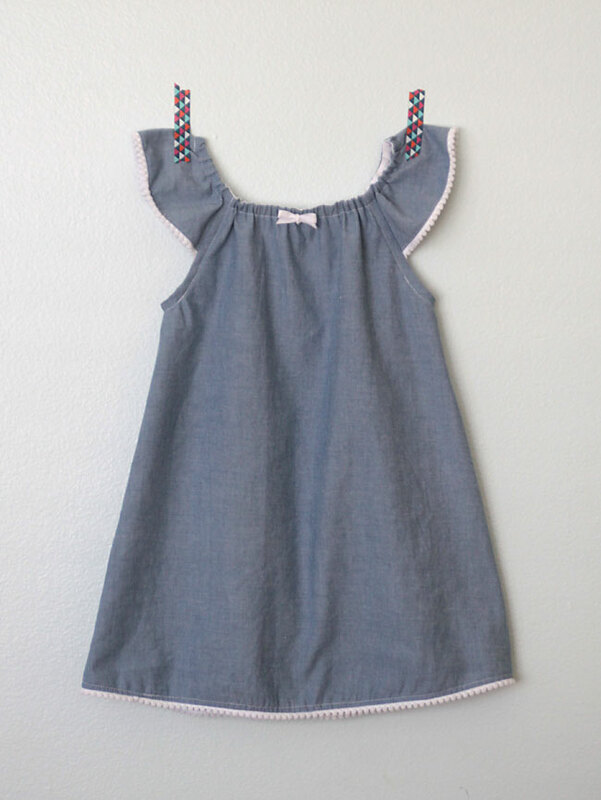 In today’s post: Learn how to sew an adorable flutter sleeve sundress for a little girl. I’m pulling this post out of the archives today for those of you who may not have been around when I first published it four years ago! The flutter sleeve sundress was one of the first sewing patterns I published on my blog, and it’s still one of my favorite things that I’ve sewn for my daughter. It’s hard to believe the little peanut in these photos is about to head to second grade (and that my oldest is a senior in high school!). 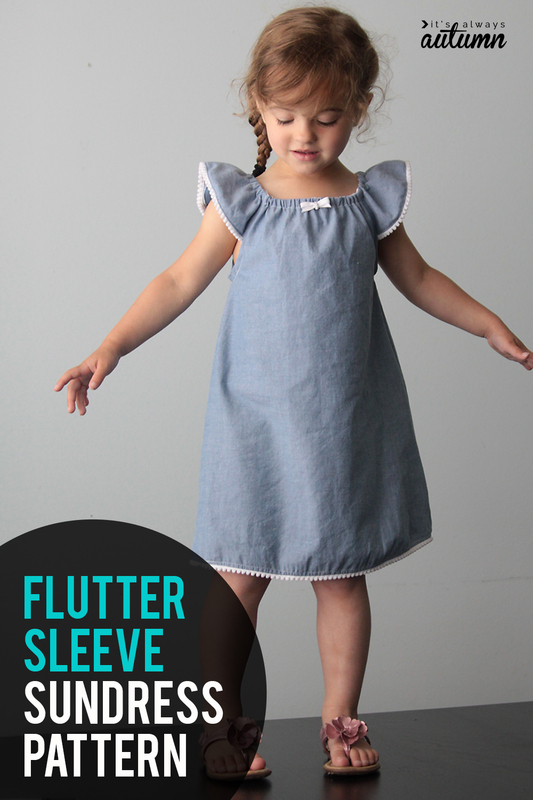 NOTE: If your daughter happens to wear size 4T, you can download a free pattern for this flutter sleeve sundress here. If not, keep reading to learn how to create the pattern in any size. Hi all! 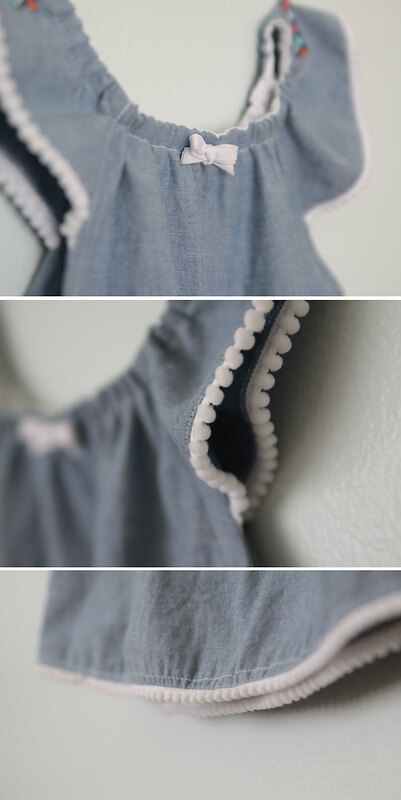 I have a really fun easy sewing project to share today – it’s a simple sundress with flutter sleeves. I made up a quick pattern using a t-shirt as reference and sewed up this dress in just a few hours. I chose a soft light blue chambray for the dress and added tiny pom pom trim around the hem and sleeves. It’s not pink, it doesn’t look like a princess dress, and my daughter actually likes it – success! The design of this dress also looks super cute as a top – click through to this post to see an example and get a free pattern in size 4T. 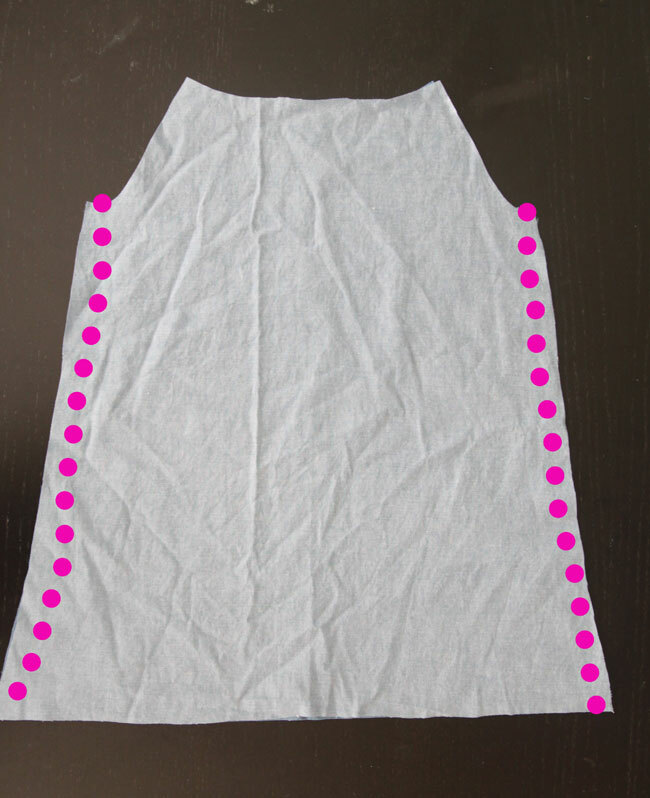 1 – I used a t-shirt that fits my daughter well and freezer paper to trace general shape I wanted from the dress, as you can see in the photo. The only thing I should have done differently is to not cut the arm opening quite so low (I moved the bottom of the armhole up almost 2 inches on the pattern, so if you’re drafting your own you may want to print the pattern for reference). I cut the pattern into two pieces – a bodice piece and a sleeve piece. The bodice piece will get cut on the fold, with the fold being down the center. The sleeve piece will also get cut on the fold, with the fold being over the shoulder. 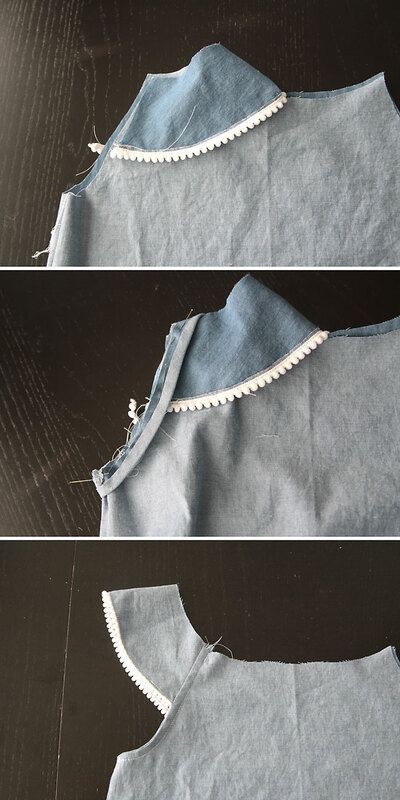 2 – I retraced the bodice piece, adding an extra 2 inches at the fold. 3 – I retraced the sleeve piece, adding an extra 2 inches at the fold. That gives the dress and sleeves enough extra room to add gathers all around the neckline and shoulders for the “peasant dress” look. Then I cut two of the bodice (on the fold) and two sleeves (on the fold). Place bodice pieces RST together and sew down the sides. Next, finish the bottom edge of the sleeve. You can just hem it, or add trim like I did. Next I attached the sleeves to the bodice and finished the arm holes with single fold bias tape, as you see below. I just made some single fold bias tape from the extra fabric for this, although it all gets folded to the inside so you don’t see it – so it doesn’t need to match. Repeat with the other sleeve/arm hole. I tied a small bow with a little extra bias tape and hand stitched it to the front of the dress. All done! If anyone’s interested, I’ll try to upload a copy of my pattern in size 4t. Let me know in the comments! You can also see what the pattern looks like as a shirt and find and more photos of how to sew the dress (or shirt) in that post. Thanks! This is absolutely adorable! I would love the pattern in a 4T. Thanks for sharing how you made the pattern. You make making patterns look so easy and doable. I’m going to be making one for my adorable niece! So cute . I need to figure out how to do this for my grandaughter, shes 12 but I think she would love this. So cute. I love ist. I will try to make one myself. What a lovely dress! Thank you so much for the great tutorial. I will have to find time to sew a couple of dresses like this for my daughters. I know they will wear them all the time! I love the tiny pom pom trim on the sleeve, sweet touch! Have a granddaughter 3T, can’t wait to make this for her. And I have a light weight fabric and this could even make up cute as a summer night gown. That is exactly what I was thinking, my daughter who’s 8 was just complaining yesterday that she needed some more summer nighties. So cute! great looking dress. I would love a 4T pattern as I have a 3.5yr old little girl who loves dresses. I would love to receive the 4T pattern of the cute sundress w/flutter sleeves to make for my four granddaughters. I love this little dress! Thank you so much for sharing it! I’d love a pattern in 4T. Love it! Thanks so much for sewing along this year! I’ve never used bias tape or made a casing like that, but it would be worth it to make a cute dress like that! Crisp and clean and adorable. And my daughter may only be turning two next month, but a size 4 pattern wouldn’t be that much too big for her! I’d love a copy of the pattern! My granddaughter is between a 4 and a 5, but if I add a bit to the seam allowances it should work…? My granddaughters do not live close to me, so I do not have a T-shirt to use as a pattern. Do you have the pattern in a 3,4,5T? This is cute summer dress. I would love the pattern too! Need it in a 3T. How much fabric would I need to buy? I just picked up a couple of pillowcases to make night gowns for my little girl! I think they might be cute with this, too. I’d love to use the 4t pattern! Would love this cute pattern! My granddaughters live far away so there’s no shirt for me to pattern after. I would love a copy of this pattern. This is adorable. I would love the pattern too Thanks so much!! What an adorable dress! I would love to recieve a copy of the pattern! Please please upload the pattern!! This is adorable. I have just the fabric for this pattern. 4T is the size that I need as well. Found you on Sew Like My Mom. Thanks ! Yes, please, upload the pattern. This dress is so cute! Thank you. This looks so doable and sweet!! Yes, please a 4T would be perfect for my little lady. She’s got long legs so I like to size her up a bit. Thanks for sharing! Oh I love it and I would your pattern in the 4T both my granddaughters or in that size now !!!!!! Thanks for a great tutorial. This dress is so simple and cute. I know my granddaughter would love this. Would love to have the pattern. Thank you for sharing. Were you able to upload the pattern? It is super cute! wear dresses. This would be perfect & I love the nightgown idea.!! What a sweet summer dress!!! I have two granddaughters who would love to have Grandma make them a dress. Do I need to do anything to get the pattern? 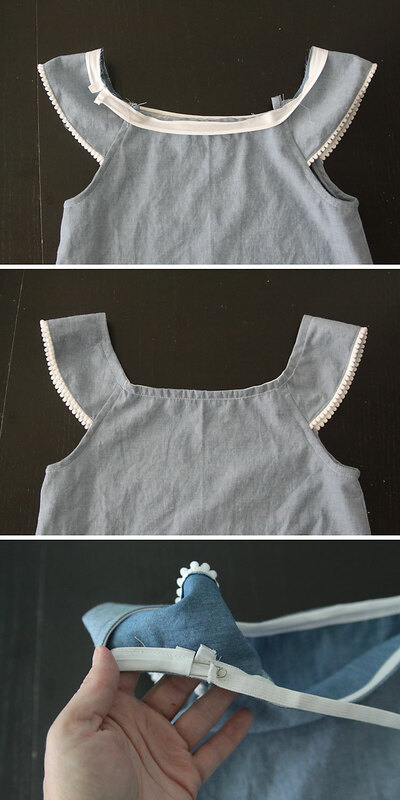 This is super cute and exactly what I have been looking for – cant wait to make it for my 4 year old! Will be making the top too!! I’d like this sz 4 pattern. Love it! I love this dress! I made one for my little girl and it’s soo cute! I’m excited to see the shirt, too! This is exactly what I have been looking for. Beautiful dress and delighted to see such clear instructions as the pin on pinterest promised! Thank you so much! Just followed your tutorial. Thank you it looks amazing. Thanks for letting me know, Maud – I’d love to see a photo of your dress! Hi, love love this dress!! i like to try for my little girls, btw your daugther is beautifull!!! Thank you so much for this tutorial. Made an awesome Top. I just made a dress for my 4 year old and it’s so cute I need to make another one! Your tutorial was very easy to follow. Thank you so much! I’m a very beginner sewer and I made it! Thanks again!! Thank you for the pattern, I love simple dresses! Lately, I’ve been on a lace kick, so I’m attempting to make this dress in Navy peach skin fabric with a navy lace overlay….we’ll see how it turns out! i WOULD REALLY LIKE TO MAKE THIS FOR MY 8 YRS OLD DAUGHTER BUT i AM NOT SURE HOW TO MAKE THE SLEEVE PATTERN, MAY YOU PLEASE DIRECT ME ON HOW TO MAKE A PATTERN FOR THE SLEEVE. THANK YOU THANK YOU SO MUCH. Have made 2 for my 4 years old and they have been on heavy rotation. Several months ago when the Trevon Martin incident happened, and Obama said, ” If I had a son, he would look like Trevon.” I Emailed this pic of your little girl to my friends, with the caption,”If I had a little girl, she would look like this adorable child.” She is so sweet. I smile at each of her pictures and enjoy seeing her as she grows up in your later posts. Thanks so much for this lovely tutorial and pattern. I have lots of fabric I have collected over the years and have decided to start making dresses and shorts for the Little Dresses for Africa program. I want a simple dress with a little shoulder coverage. This pattern is perfect! I may adapt it to use a tieable drawstring since once the elastic stretches out, the garment is no longer usable there. Thanks again. Hi, I am crazy over this flutter by dress and top, I have search your site thoroughly and cannot find a detailed description of the pattern, sizes, amount of material, cutting out, pattern markings etc. I would really appreciate if you could send me a PDF of the thorough pattern. Kind regards Jeannette. My daughter in law is a beginner and is looking for the actual printable pattern for this dress. The only one we found is a picture of the pattern. Is there one that is true to size? The link to download is in the paragraph above the photo of the pattern. Good luck! You did a great job explain how to make the dress in reference to a shirt. … very creative! I’ve got a couple of granddaughters that would look gorgeous in this beautiful spring dress. Thank you for sharing your talent! Can’t wait to make dresses for Operation Christmas child using this pattern. And for my two 3 year old granddaughters!!! The only thing I don’t see here is how much material should I get for the 4T dress or top. Thank you again! Super glad you added this info. I live in Mexico and when I visit the US I make up a list of fabric I need. And I really can’t over-buy due to weight! Thanks! This is first pattern ive sewn not out of a packet and I’m super excited to try it! Just about to start one for my little girl. Thank you! I am a complete beginner and this was the first pattern I found online and decided to try. Your instructions have been so precise that the dress turned out to be beautiful and well-made. inspired, I decided to make more for my friends with little or big girls ( you see, I have only sons and have this unrequited itch for flutter sleeves and flowery patterns). By the time of this message, I have made 6 dresses and tops for ages 2, 4, 6, 8, 12 and 40. Very pretty and easy to do. I love this site thank you!! OK. I figured the sleeves out! Wish I could share a pic! Halloween dress for my granddaughter turned out so cute. Thanks for the pattern! Thanks for the tutorial! I just made my daughter one using organic Cloud 9 blue apple fabric with sunshine yellow Pom Pom trim and it’s adorable! I wish I could link a picture! I just made one on T6. Thank you very much! 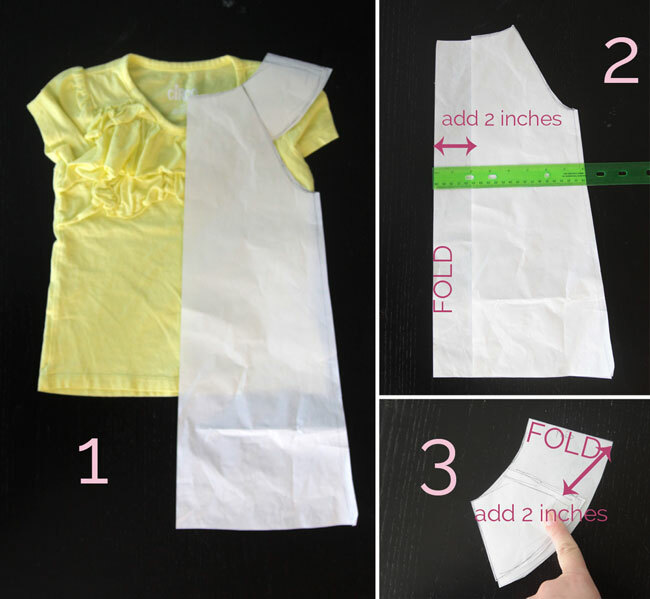 I love the cute little dress you made for your daughter, mine is the exact same size and I’m a beginner with sewing so I’ll give it a try, but I can’t understand what “RST” means like you explained here : Place bodice pieces RST together and sew down the sides. Can you please let me know that would be adorable ? RST = right sides together. Good luck! Hi there! I will Sew this tonight in size 2years, BUT how do You measure the length of the Elastic ?????? ?